I'm relatively sure we are all experiencing quite a hot summer, regardless of where we are individually located. 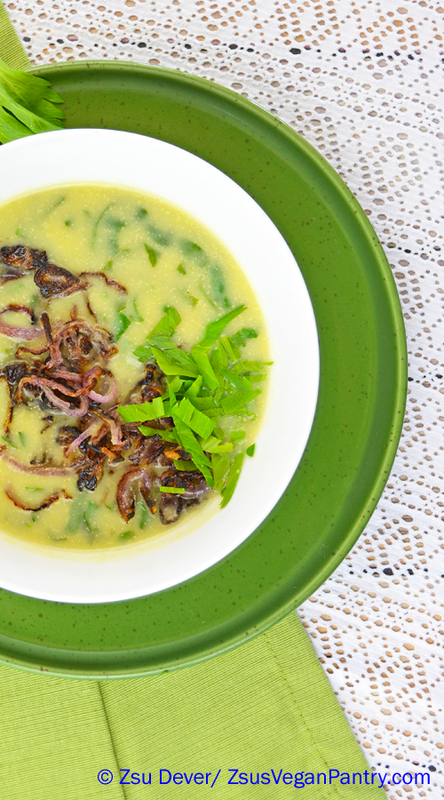 While the weather is so scorching, soup might seem to be the last meal on your mind to make, but this Cream of Celery Soup with Spinach and Crispy Onion is light and delicate. I chose celery as the base of this soup because celery automatically brings to mind a level of coolness and it is easy on the budget. Since celery is very stringy (in fact, I like to peel my celery before I dip the stalks in any dip) it is imperative that the soup be strained through a fine mesh strainer, otherwise instead of enjoying a delicious soup, you'll find your mouth full of celery fiber. This is not as difficult as it sounds, and the straining can be accomplished in around five minutes. Transfer your soup to the strainer set over a clean pot and use the back of a ladle to swirl the soup around in the strainer. This motion will effectively push the soup through the strainer without back-aching strain. There was a comedian on Last Comic Standing a few weeks ago who joked that since celery is about 10 calories, the digestive process requires more energy than the celery provides, therefore you can kill yourself eating celery. To avoid this calamity, I've added thin ribbons of spinach to increase the nutrition. 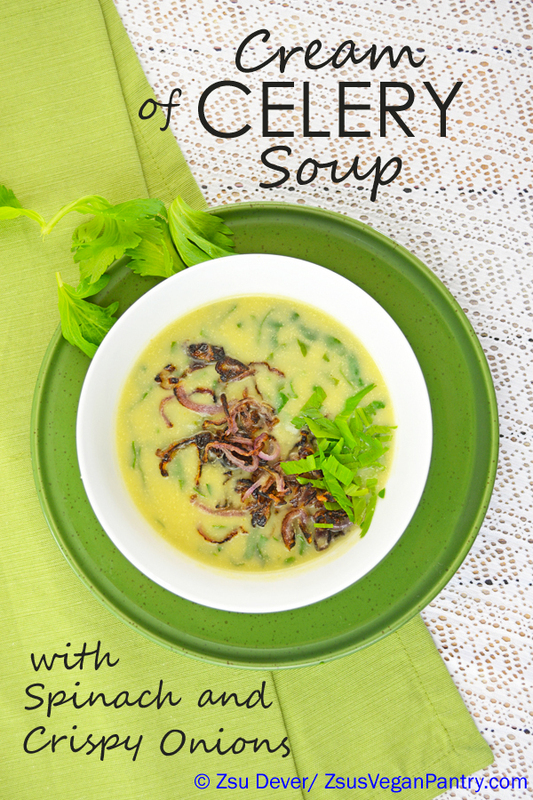 The soup is garnished with crispy fried onions, which adds another layer of flavor, and minced celery leaves, which increases the celery flavor. There is a little bit of vegan cream cheese in the soup and some might be tempted to omit it, however, doing so is the difference between a creamy potato soup with celery and cream of celery soup. 1. Heat the oil in a large pot over medium heat. Stir in the celery and onion. Cook for 2 minutes to soften the vegetables. Add the potato and cayenne. Stir and cook for 2 more minutes. Stir in the vegetable broth and water. Season with salt and white pepper. Bring to boil, reduce to simmer and cook until the potatoes are very tender, about 15 minutes. 2. Blend the soup until smooth using an immersion blender or use a standard blender, taking care not to overfill the blender jar. Strain the soup through a fine mesh strainer into a clean pot. Use the back of a ladle, swirling the soup in the strainer, to move the soup through the strainer and into the pot. 3. Return the soup to a simmer, add the spinach and cook gently until the spinach is tender. Stir in the cream cheese, using a wooden spoon to stir until smooth. Stir in the lemon juice, taste and adjust seasoning. 4. Mince the reserved celery leaves and serve the soup garnished with the Crispy Onions and celery leaves. 1. Toss the onion and arrowroot. Season with salt and black pepper. 2. Heat the oil over medium heat in a medium skillet. Add the onions, stir with the oil and cook until crispy, stirring occasionally. © 2014 Copyright Zsu Dever. All rights reserved. I am linking to these recipe parties: Healthy Vegan Fridays, What I Ate Wednesday, Gluten-Free Fridays and Virtual Vegan Linky Potluck. This is so fresh, Zsu! I used to love Campbell's cream of celery soup and have been looking for a replacement since going vegan. Can't wait to try it! Let me know if you try it - it would be awesome to hear the comparison. We were more the cream of mushroom people. This looked so delicious it didn't even get to the blender. And yes it was delicious after all, even in another form. Awesome! The best recipes are the ones you can adapt to fit your needs. Thank you for the feedback!